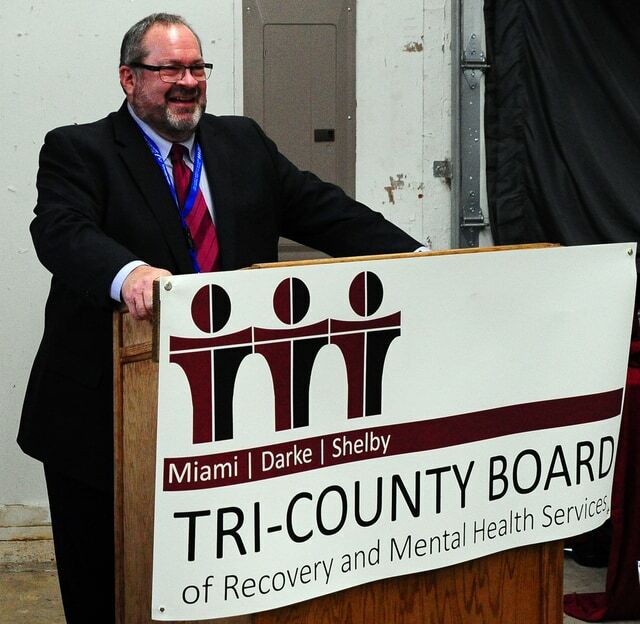 Mike Ullery | Daily Call A groundbreaking ceremony for One Wellness Place, a one-stop-shop for services of the Tri-County Board of Recovery and Mental Health Services, was held at the Miami County Fairgrounds on Thursday. The board covers Miami, Shelby, and Darke counties. Among the dignitaries participating in the groundbreaking were, left to right, Sen. Bill Beagle, Miami County Sheriff Dave Duchak, Mark McDaniel, director of the Tri-County Board, and Miami County Commissioners Greg Simmons and Bud O’Brien. 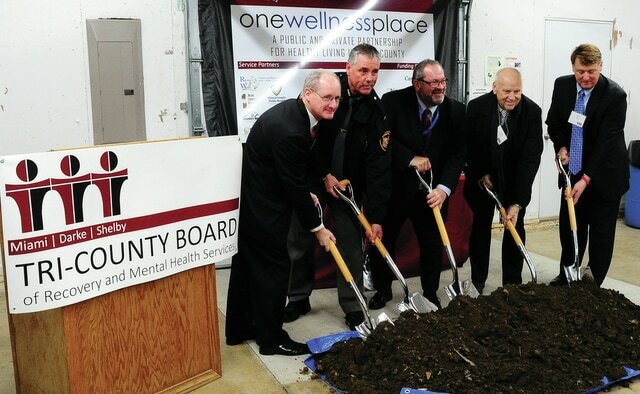 A groundbreaking ceremony for One Wellness Place, a one-stop-shop for services of the Tri-County Board of Mental Health and Recovery Council, was held at the Miami County Fairgrounds on Thursday, Jan. 26. 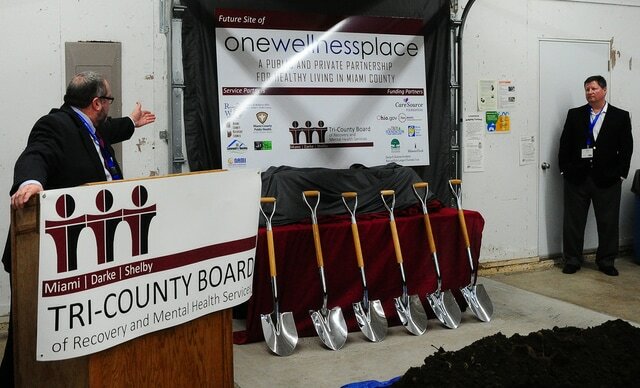 MIAMI COUNTY — The Tri-County Board of Mental Health unveiled its vision for a “one-stop shop” for health and human services under one roof in a center they’ve dubbed “One Wellness Place” during a fundraising campaign and ground breaking ceremony on Thursday. The project plans to construct a 35-40,000 square foot building to house a variety of health and human services agencies. The TCBMH recently purchased 7.7 acres from Roger and Scherre Mumpower on North County Road 25-A near Lytle Road for the future “One Wellness Place” project site, adjacent to the Health Partners of Miami County. It was an inefficient and burdensome process that sparked the idea of a one-stop center for the Tri-County Board of Mental Health to host community resources under one roof, according to Executive Director Mark McDaniel. “We wanted to have a much more structured process for people to come into for a more comprehensive assessment. 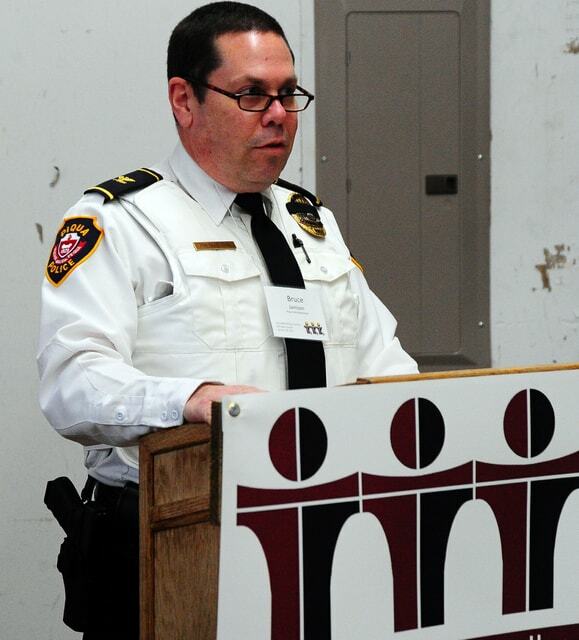 Individuals would come in for services and then be assessed for a wide array of services all the way from addiction services, mental health and dental services, and all kinds of medical and health related things, so we really wanted to broaden our scope,” McDaniel said. McDaniel estimated a savings of $250,000 in overhead costs once the community organizations are under one roof, redirecting the funds back into the agencies and the clients they serve, he said. Streamlining the services would allow rent savings and agencies would prorate utilities costs with one another at One Wellness Place. “We feel we have a project that this county and this community will be very proud of,” McDaniel said. McDaniel said the building design process will kick off this week, which will include ways agencies can share space and coordinate with one others within the facility. 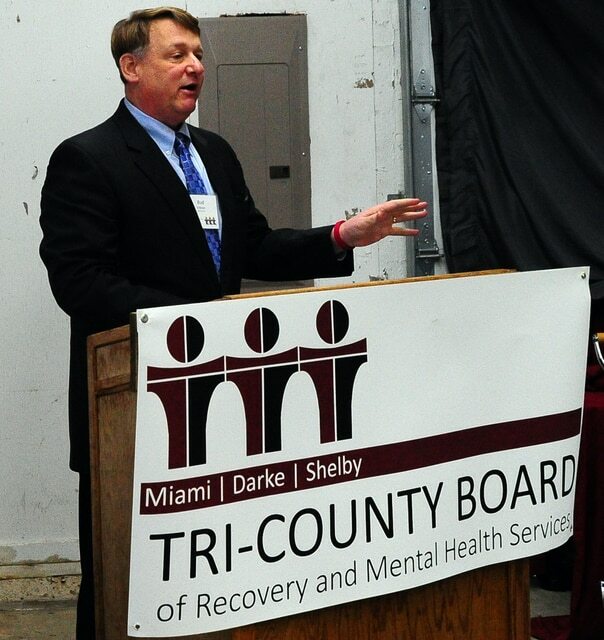 Memorandums of understanding have been made for the planning and development stage of the project with the following agencies: Tri-County Board of Recovery and Mental Health Services, Recovery and Wellness Centers of Midwest Ohio, Community Housing, NAMI of Darke, Miami and Shelby Counties, SafeHaven Inc., Miami County Health Department, Miami County Dental Clinic and Miami County Recovery Council. 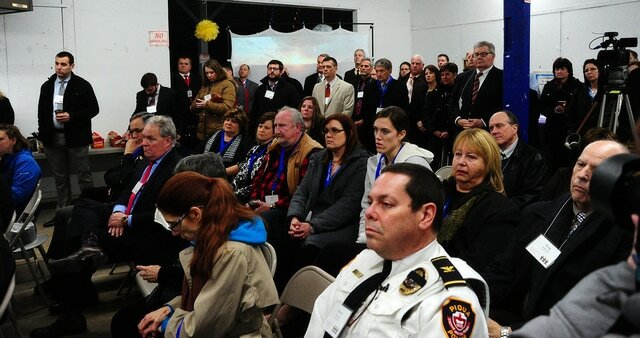 Other agencies may partner with the One Wellness Place project as it develops, McDaniel said. The Tri-County Board has earmarked $2 million of its own funding for the project, which will be a public/private partnership with the community, McDaniel said. Services would be available for Miami, Shelby and Darke county residents. Support for the project includes $500,000 from the Dayton Development Coalitions Priority Development and Advocacy Committee through the fiscal year 2017-18’s state capital budget bill. 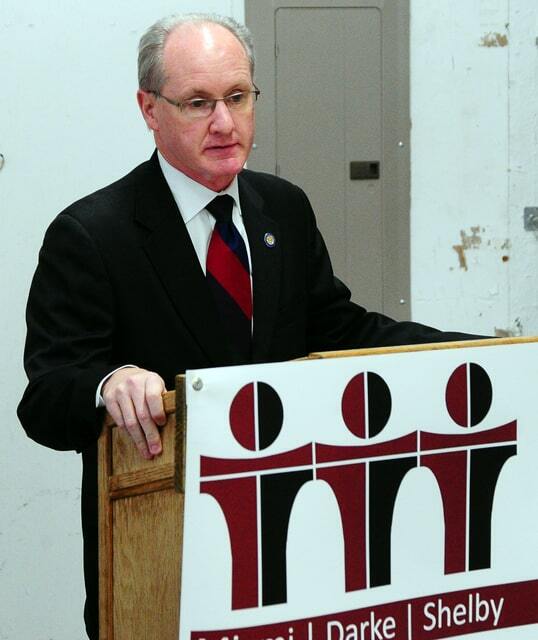 The funding was secured with help from local legislators Sen. Bill Beagle and Rep. Dr. Stephen Huffman. CareSource Inc. also pledged $220,000 for the project as well as in-kind staff. Other donors include the Troy Foundation, Miami Valley Steel Services in memory of Heather Dawson, The Dayton Foundation, Minster Bank, The George B. Quatman Foundation, the Neils and Ruth Lundgard Charitable Trust and the Hartzell Norris Trust have contributed or pledged donations. The Troy Foundation has designated a 501-3c non-profit fund called the Tri-County Board of Mental Health Building Fund. For more information, visit www.tcbmds.org or to make a donation, visit www.thetroyfoundation.org and select the Tri-County Board of Mental Health Building Fund. 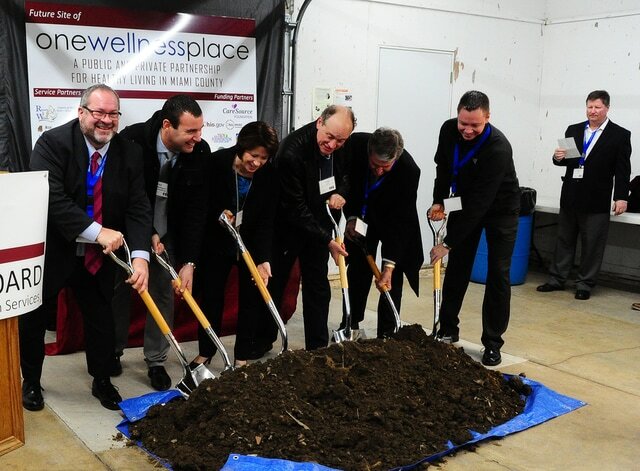 https://www.dailycall.com/wp-content/uploads/sites/30/2017/01/web1_012617mju_TriCountyBoard_GroundBreaking1.jpgMike Ullery | Daily Call A groundbreaking ceremony for One Wellness Place, a one-stop-shop for services of the Tri-County Board of Recovery and Mental Health Services, was held at the Miami County Fairgrounds on Thursday. The board covers Miami, Shelby, and Darke counties. Among the dignitaries participating in the groundbreaking were, left to right, Sen. Bill Beagle, Miami County Sheriff Dave Duchak, Mark McDaniel, director of the Tri-County Board, and Miami County Commissioners Greg Simmons and Bud O’Brien. 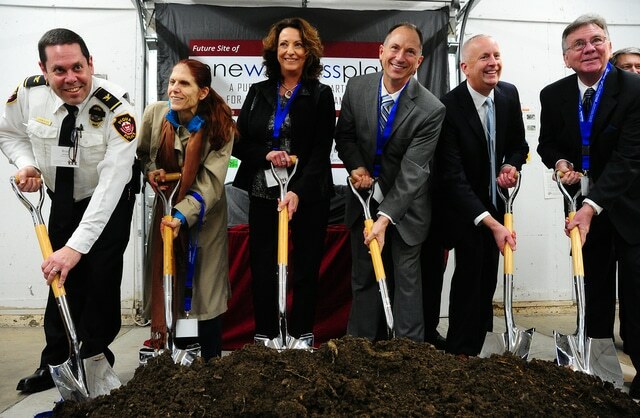 https://www.dailycall.com/wp-content/uploads/sites/30/2017/01/web1_MU2_4399.jpgA groundbreaking ceremony for One Wellness Place, a one-stop-shop for services of the Tri-County Board of Mental Health and Recovery Council, was held at the Miami County Fairgrounds on Thursday, Jan. 26.
https://www.dailycall.com/wp-content/uploads/sites/30/2017/01/web1_MU2_4403.jpgA groundbreaking ceremony for One Wellness Place, a one-stop-shop for services of the Tri-County Board of Mental Health and Recovery Council, was held at the Miami County Fairgrounds on Thursday, Jan. 26.
https://www.dailycall.com/wp-content/uploads/sites/30/2017/01/web1_MU2_4409.jpgA groundbreaking ceremony for One Wellness Place, a one-stop-shop for services of the Tri-County Board of Mental Health and Recovery Council, was held at the Miami County Fairgrounds on Thursday, Jan. 26.
https://www.dailycall.com/wp-content/uploads/sites/30/2017/01/web1_MU2_4422.jpgA groundbreaking ceremony for One Wellness Place, a one-stop-shop for services of the Tri-County Board of Mental Health and Recovery Council, was held at the Miami County Fairgrounds on Thursday, Jan. 26.
https://www.dailycall.com/wp-content/uploads/sites/30/2017/01/web1_MU2_4428.jpgA groundbreaking ceremony for One Wellness Place, a one-stop-shop for services of the Tri-County Board of Mental Health and Recovery Council, was held at the Miami County Fairgrounds on Thursday, Jan. 26.
https://www.dailycall.com/wp-content/uploads/sites/30/2017/01/web1_MU2_4447.jpgA groundbreaking ceremony for One Wellness Place, a one-stop-shop for services of the Tri-County Board of Mental Health and Recovery Council, was held at the Miami County Fairgrounds on Thursday, Jan. 26.
https://www.dailycall.com/wp-content/uploads/sites/30/2017/01/web1_MU2_4459.jpgA groundbreaking ceremony for One Wellness Place, a one-stop-shop for services of the Tri-County Board of Mental Health and Recovery Council, was held at the Miami County Fairgrounds on Thursday, Jan. 26.
https://www.dailycall.com/wp-content/uploads/sites/30/2017/01/web1_MU2_4479.jpgA groundbreaking ceremony for One Wellness Place, a one-stop-shop for services of the Tri-County Board of Mental Health and Recovery Council, was held at the Miami County Fairgrounds on Thursday, Jan. 26.